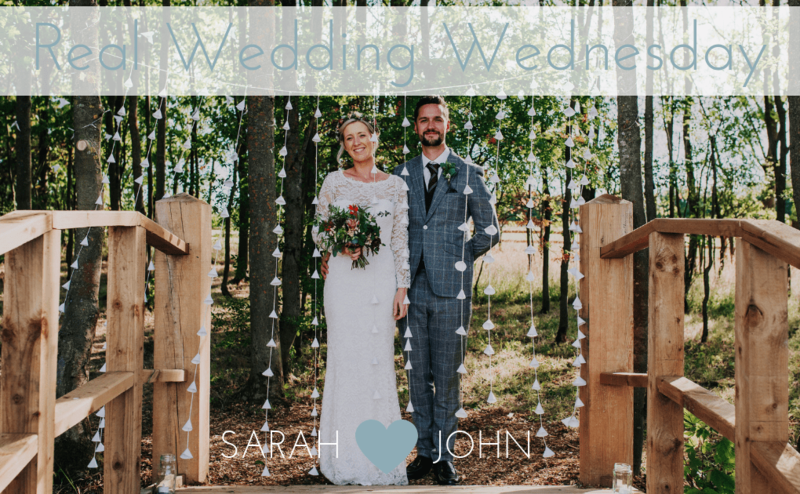 With winter well and truly upon us, we thought we’d take a look back at Sarah and John’s wedding from August this year. 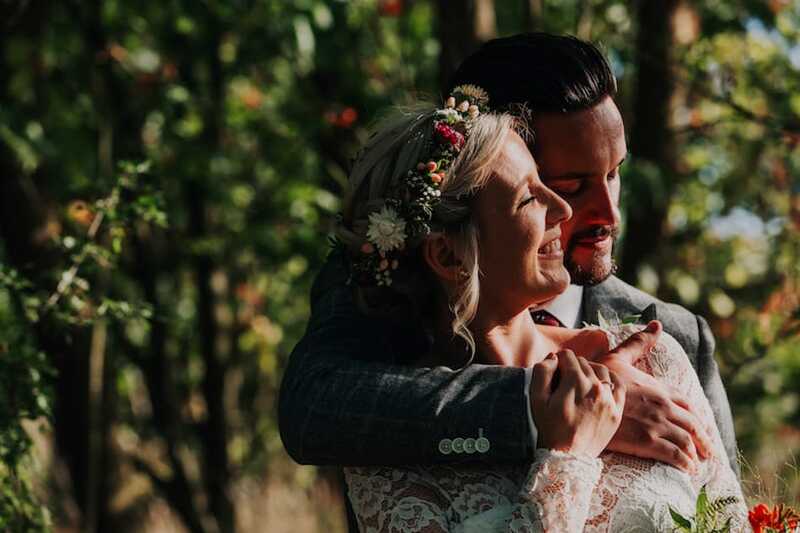 They were blessed with gorgeous weather, blue skies and lots of sunshine. 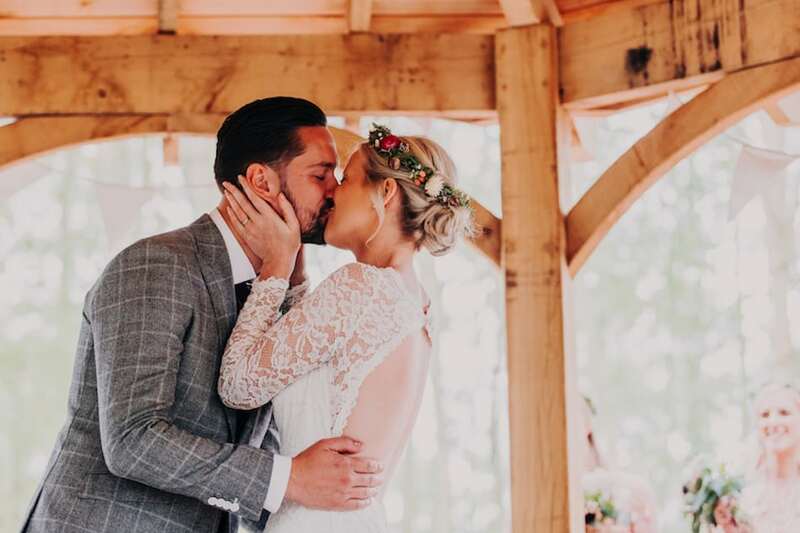 The woodland inspired venue and boho styling touches gave them the relaxed homely feel they always hoped for for their special day. 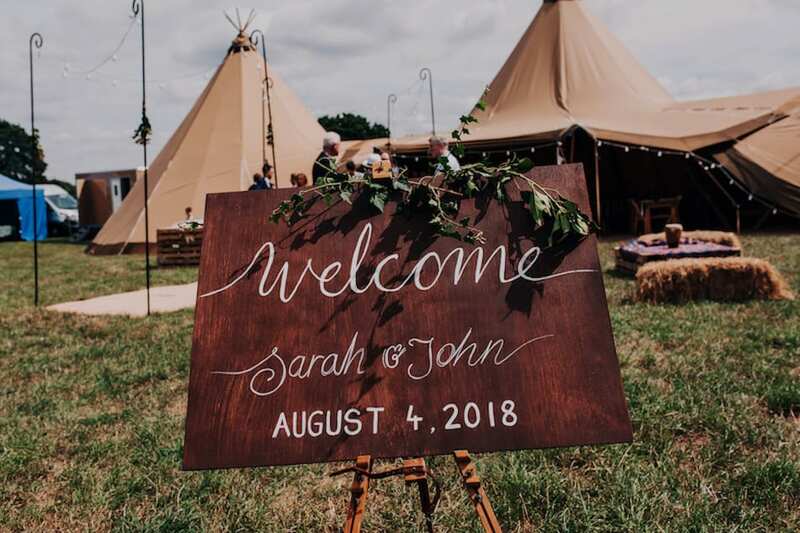 Sarah and John have been kind enough to share the story of their day, with heaps of inspiration to help guide you through creating your own woodland tipi wedding. We both absolutely adore being outdoors. 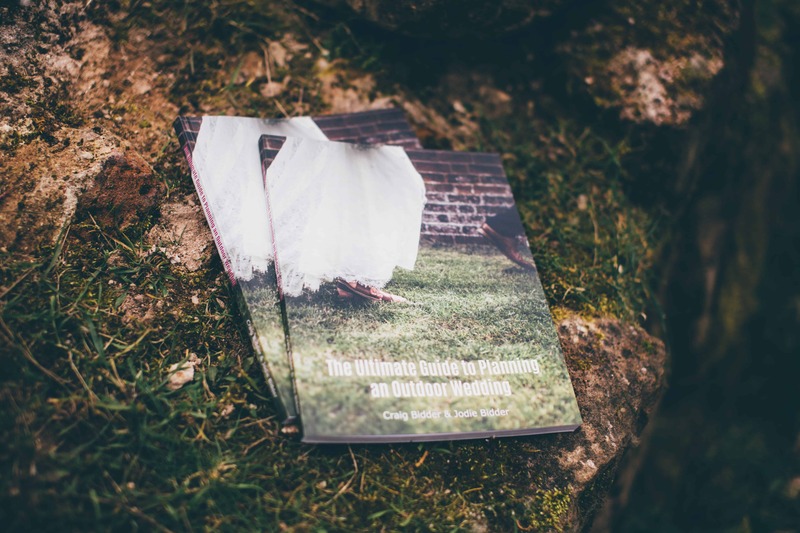 Whether it’s working in the garden, going on long walks or camping with friends. 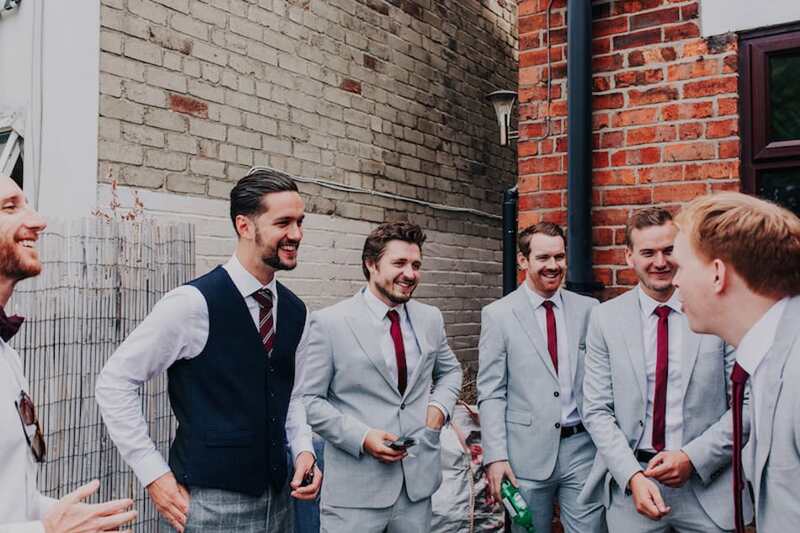 When we got engaged in Vietnam, we knew straight away that we wanted to get married outside. 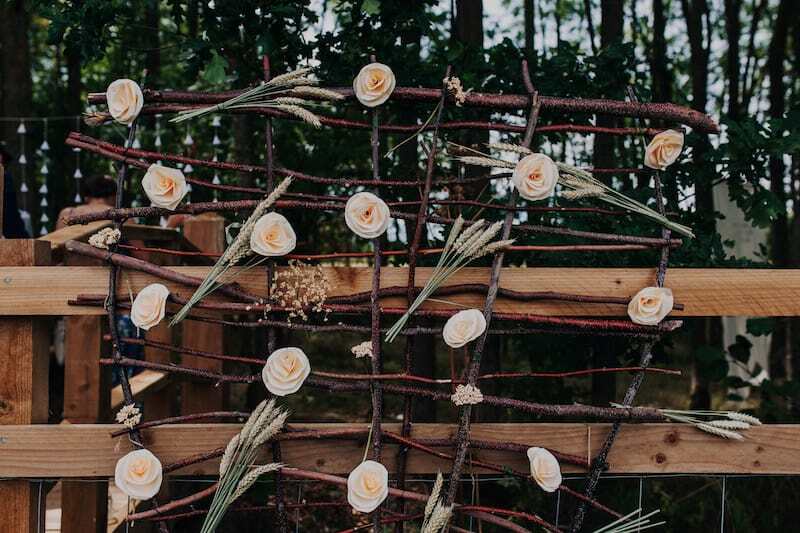 There was something so magical about dreaming up woodland decor and imagining all the people we love gathered together under the trees. 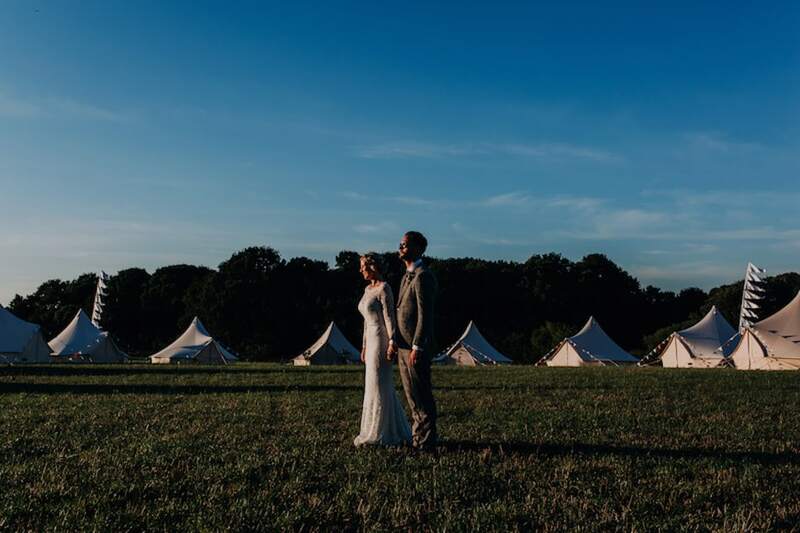 How did you decide on tipis? 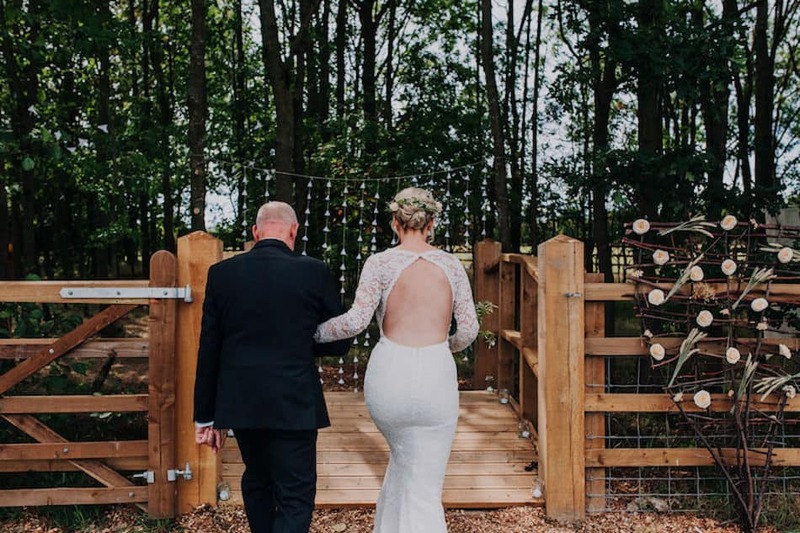 After we had decided on a woodland ceremony, we needed to think about our reception and also the potential for bad weather! 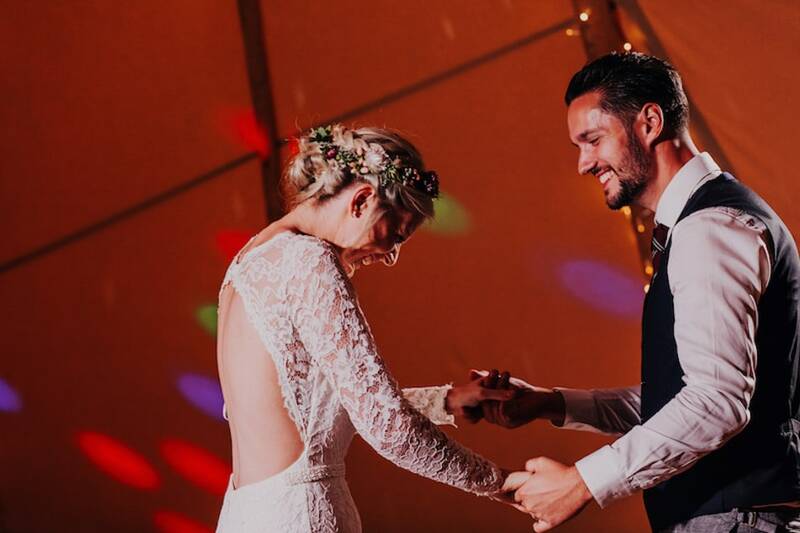 We originally started looking at marquees which were fine… but we both felt they lacked that magical feeling. 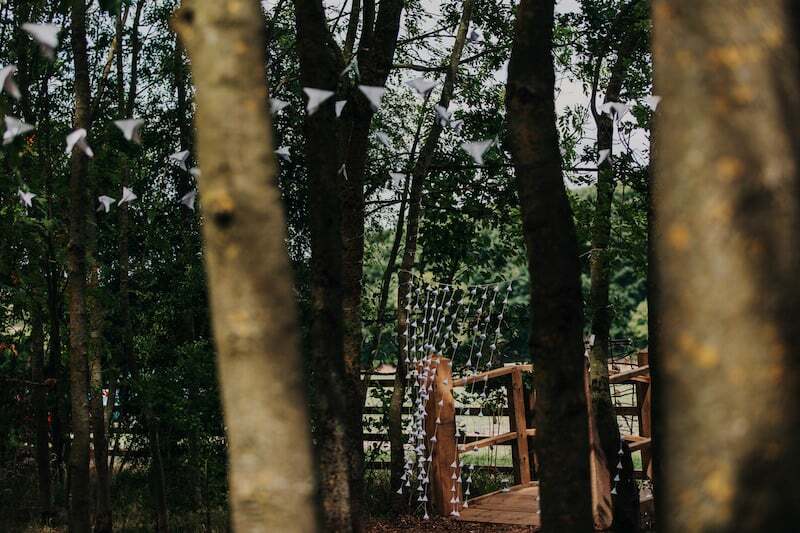 As well as that, we just didn’t feel they were in fitting with our dream of having a woodland wedding. 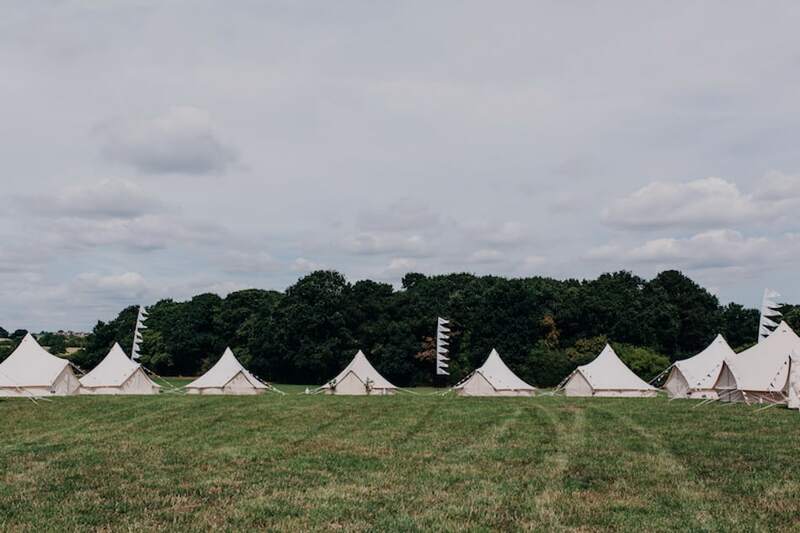 Another massive selling point for us was that Jodie told us the tipis would be ours for the whole weekend. 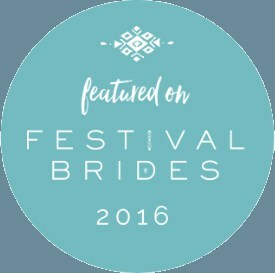 This worked out with our venue and it meant we didn’t just have a wedding day but a wedding weekend. 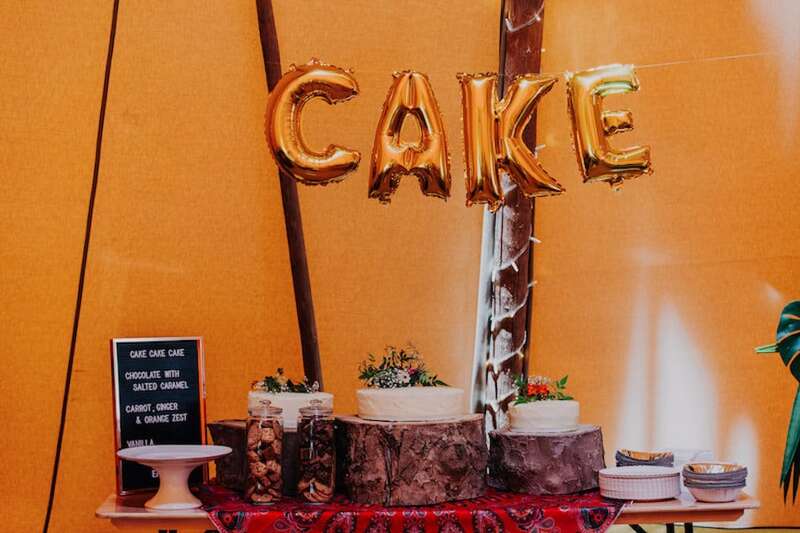 We hired bell tents through Tinker’s Bells which meant our guests had the option to camp for the weekend and continue the celebrations! 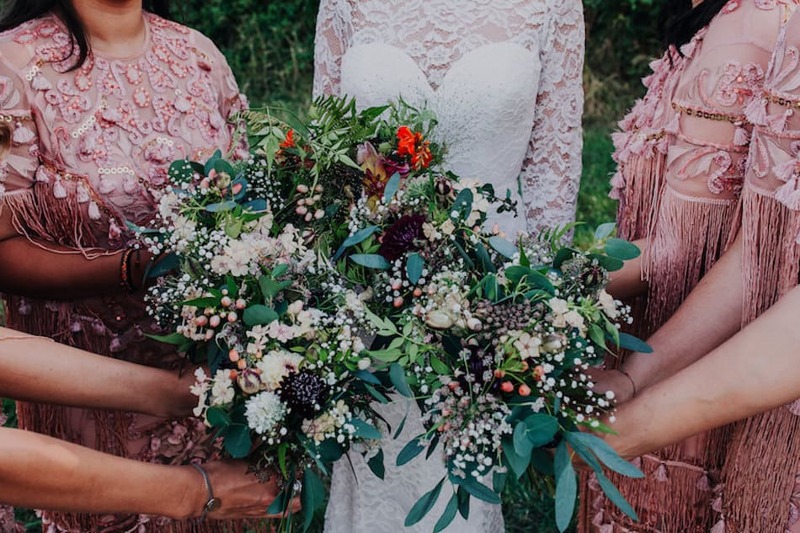 I had always wanted a lace dress with full length sleeves and despite people saying “You never know! You might choose completely the opposite”, I didn’t! 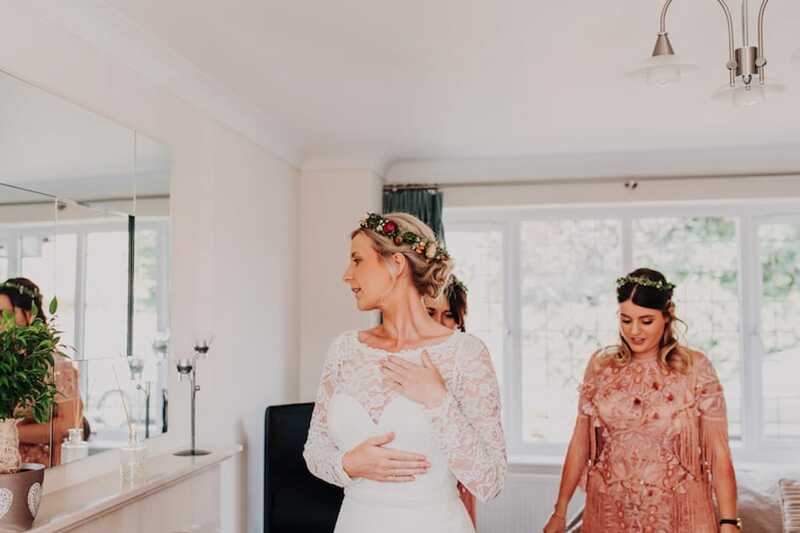 It was the second dress I tried on and it’s so true when people say, “You’ll know when you’ve found the one.” I always found that really hard to believe but they were all so right. 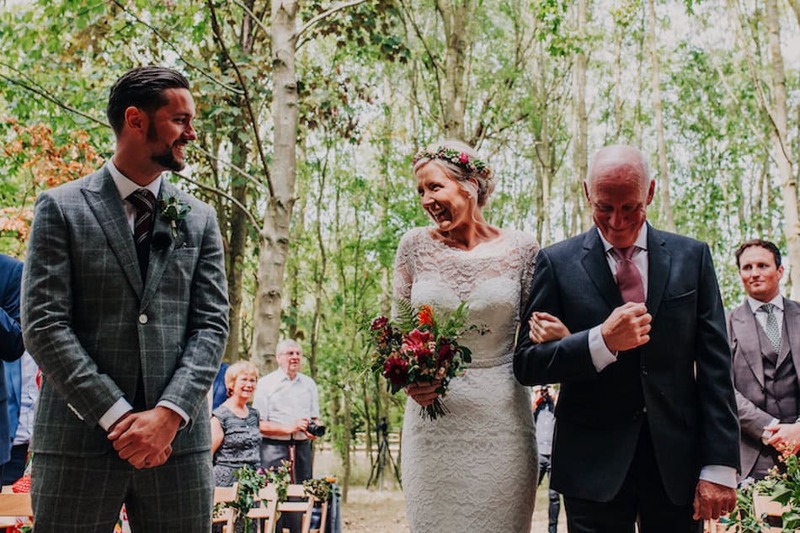 My mum and maid of honour burst into tears when they first saw me in it, as did my dad on the morning of the wedding. It’s not often, if ever, I feel confident enough to say I look nice but, in that dress, I felt beautiful. 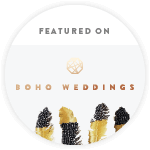 Mimi Toko, the bridal shop in Duffield, were EXCELLENT and it was such a memorable experience. John knew what he wanted from the start too! It was always a checked suit. 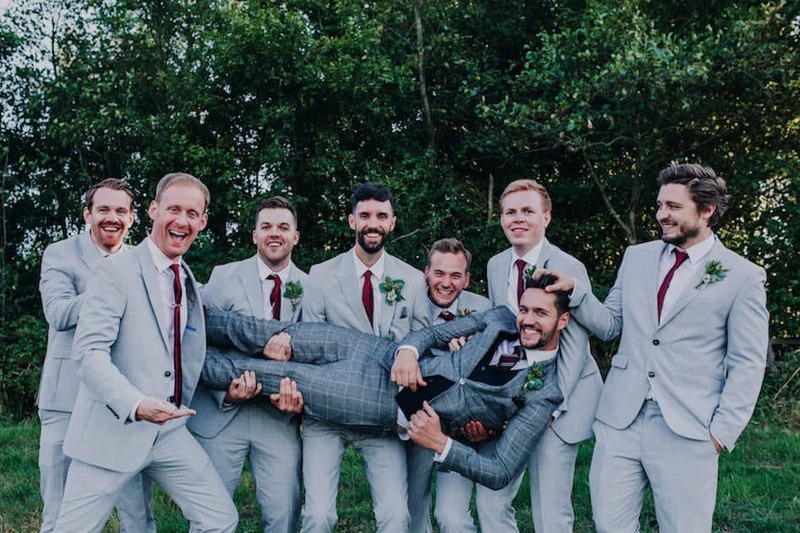 He wanted to combine greys with burgundy reds or oranges and it was important for him to wear something slightly different from the other guys in the bridal party. 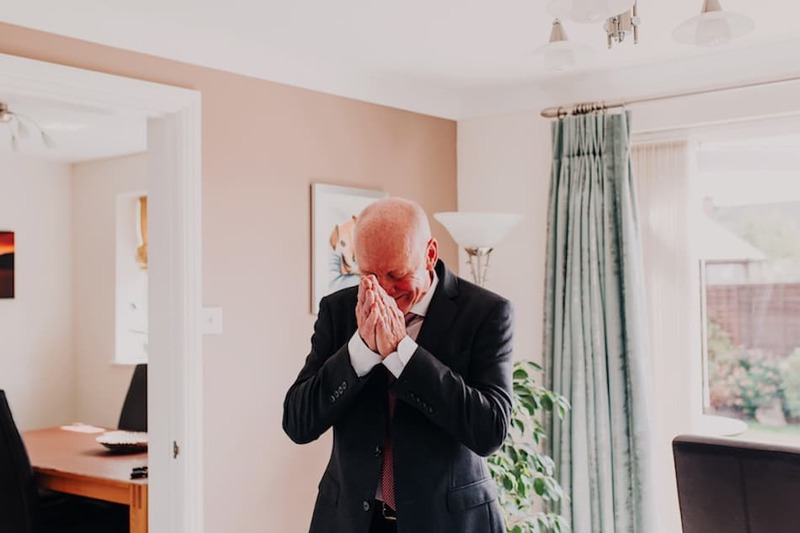 After trying on a couple of suits, just like me, he knew which suits were the ones for him, his 3 best men and 4 groomsmen. 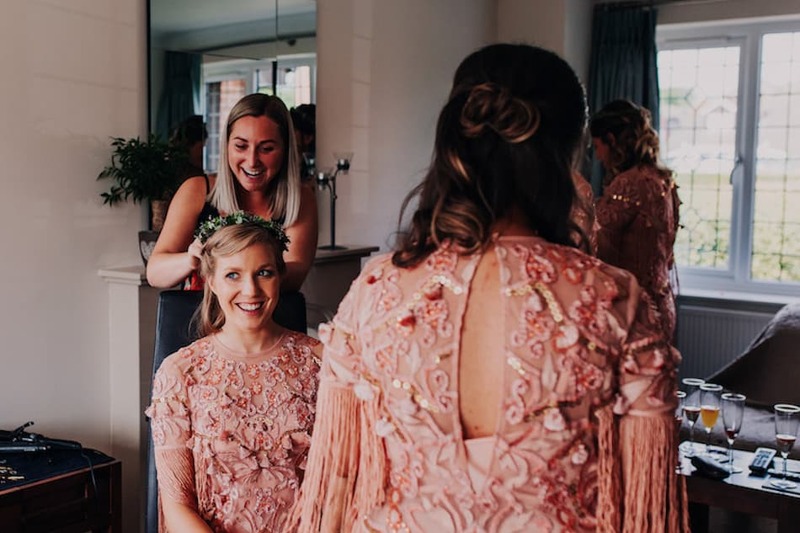 Bridesmaid dresses were so much fun to look around for! We all had a WhatsApp group and would constantly share ideas and options with each other. 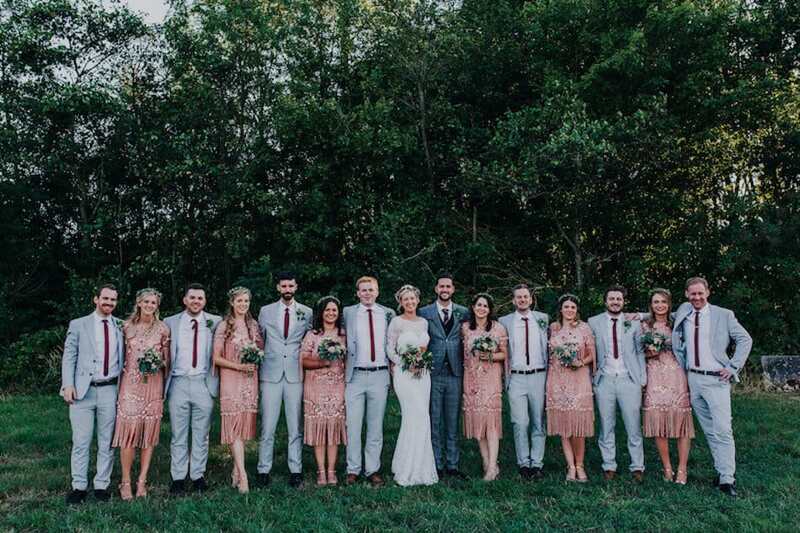 I had 6 bridesmaids and I wanted to make sure that we chose a style that everyone felt comfortable in. That was definitely the hardest part. 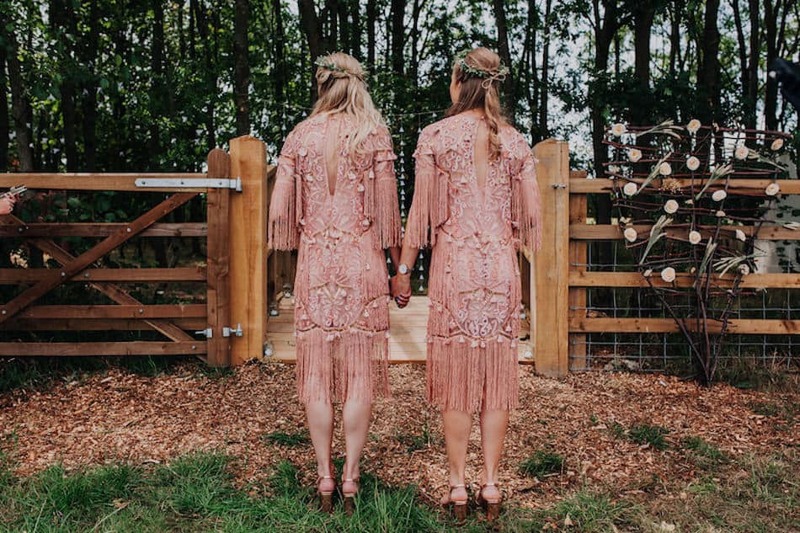 With it being a woodland wedding, we really wanted the dresses to reflect that. Something that would float or move in the breeze and something that wasn’t particularly traditional. I remember the day we found the perfect option on ASOS. You’ve never seen so many WhatsApp notifications! 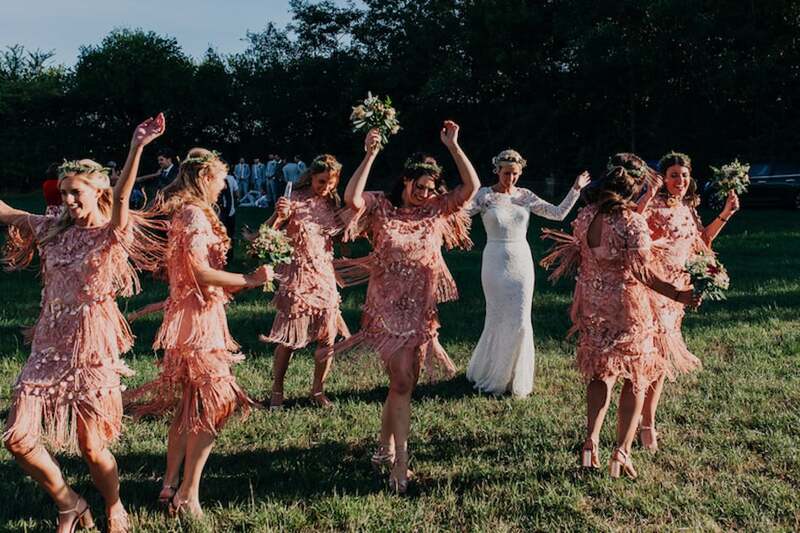 They were beautiful, and the dresses were commented on so much throughout the day by guests! 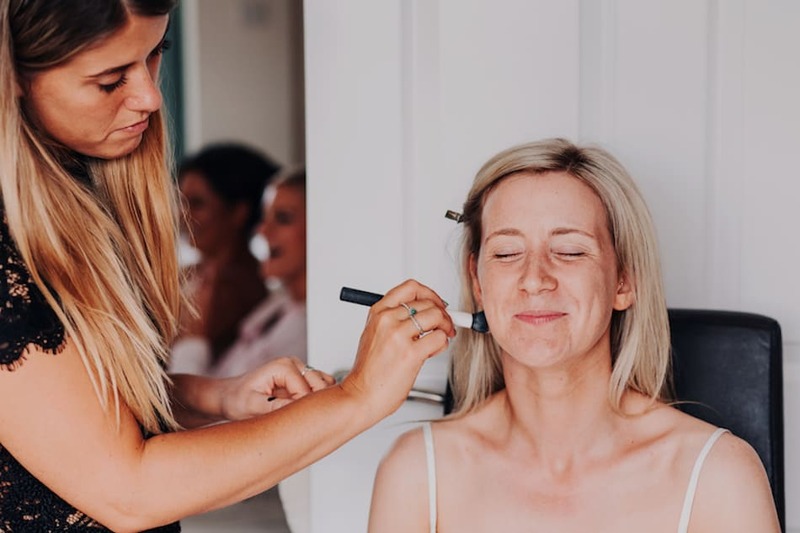 Hair and make-up were done by Ferne and Lauren from Ferne Alexandra Salon in Derby. Gosh they were just brilliant. I would write more about them but if you go and visit their Facebook page you can read my gushing review there. Those girls made me feel on top of the world. 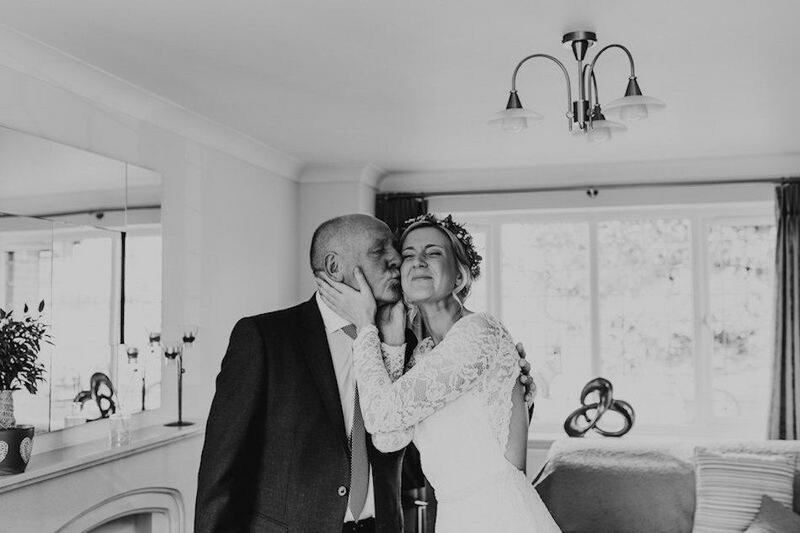 On the day, our ceremony was perfect. 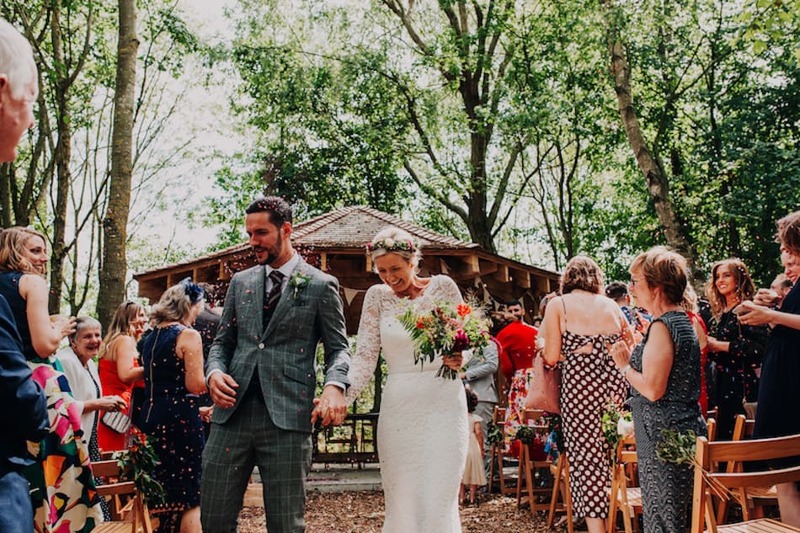 The sun was shining and everyone we love gathered in the woodland area just like we had imagined. 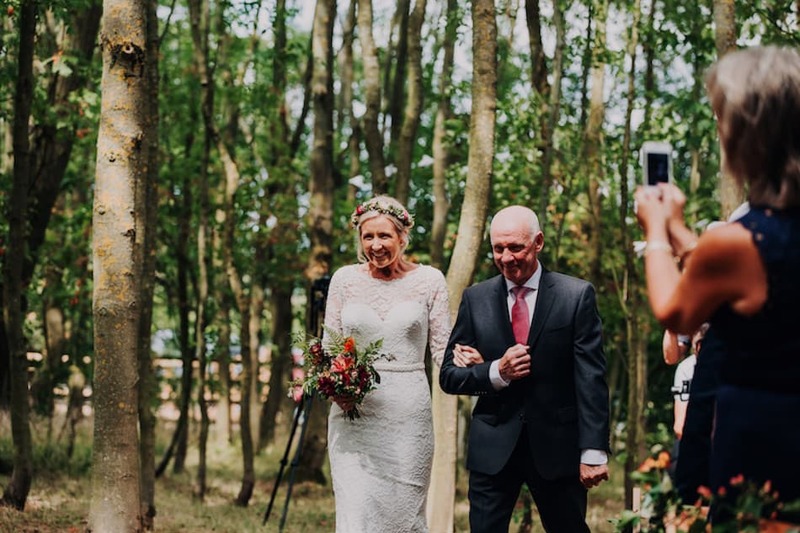 The venue we chose was Mapperley Farm in Derbyshire and we could not have dreamt of a more idyllic location to host our wedding day. 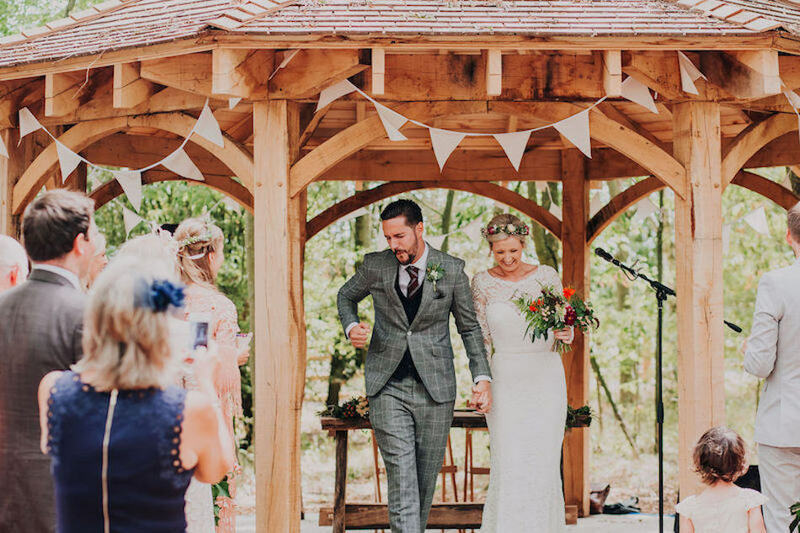 At 1.30pm I heard ‘Dancing in the dark’ (the John Legend cover) play through the trees and I knew it was time to walk down the not so traditional aisle! John was waiting at the front and as soon as I saw him I felt so much more relaxed. Holding his hand helped steady me a little too! 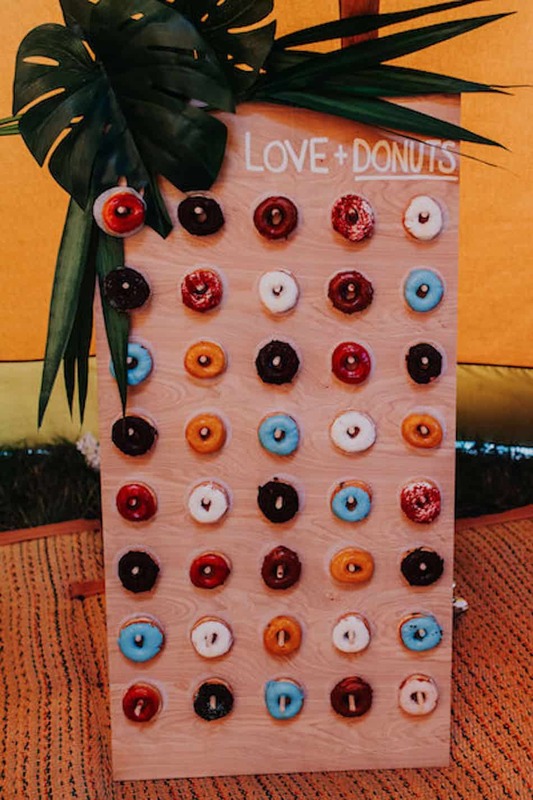 We knew we wanted everyone to have a little snack after the ceremony, but we were also working to a budget so didn’t want to go crazy. 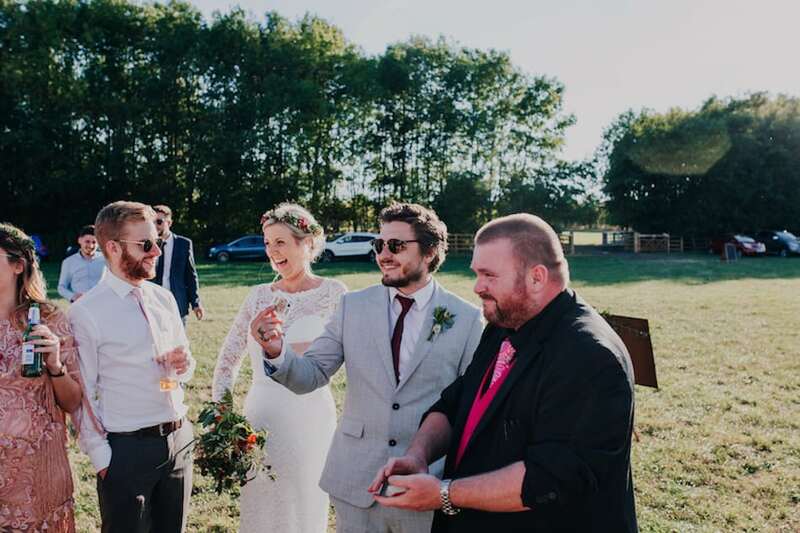 In the end we ordered the canapés from Waitrose. They were really reasonably priced, and they went down a treat! The main meal of the day was a BBQ. 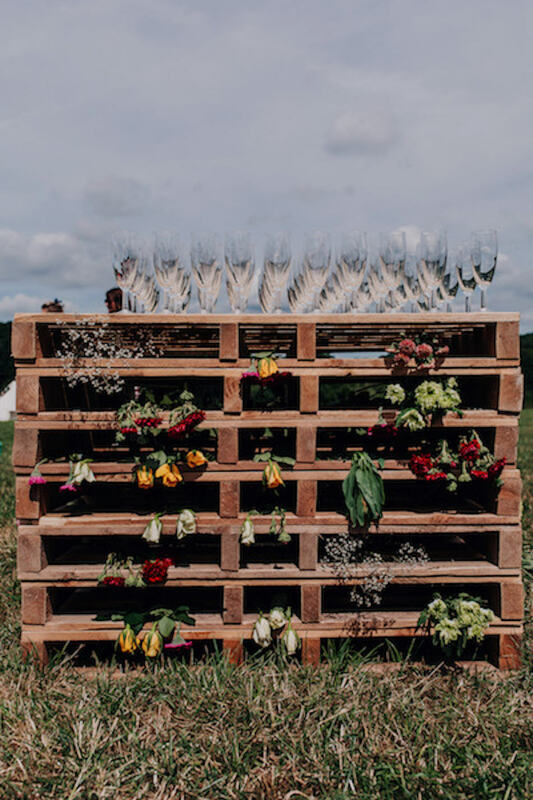 We had always wanted something really relaxed where guests go up and help themselves as opposed to a formal sit-down meal. 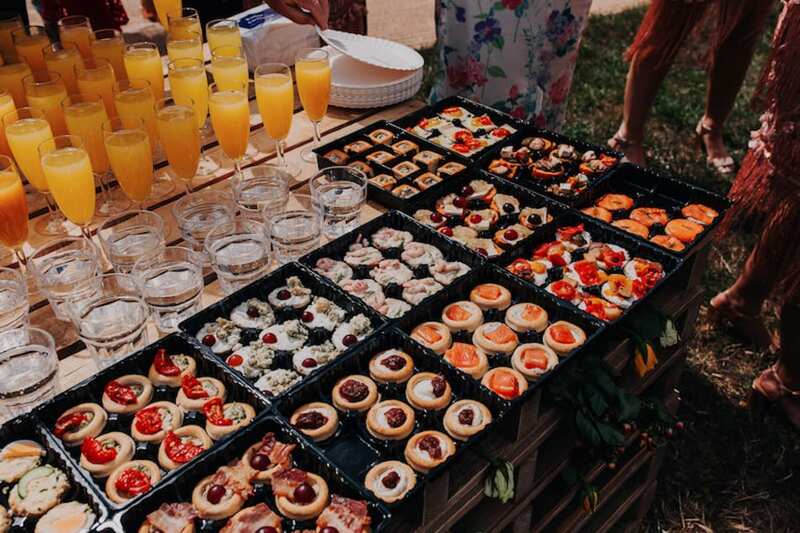 Ironbridge Catering Company offered just that. We selected a few meat options, veggie options and salads. All of which were served on pressed palm leaf plates. The staff were so friendly and interacted with all of our guests throughout the day. We had so many comments on how amazing the food was. As for the evening it was hands down always going to be pizza. John and I love pizza and we just thought it was a great option that would please everyone. 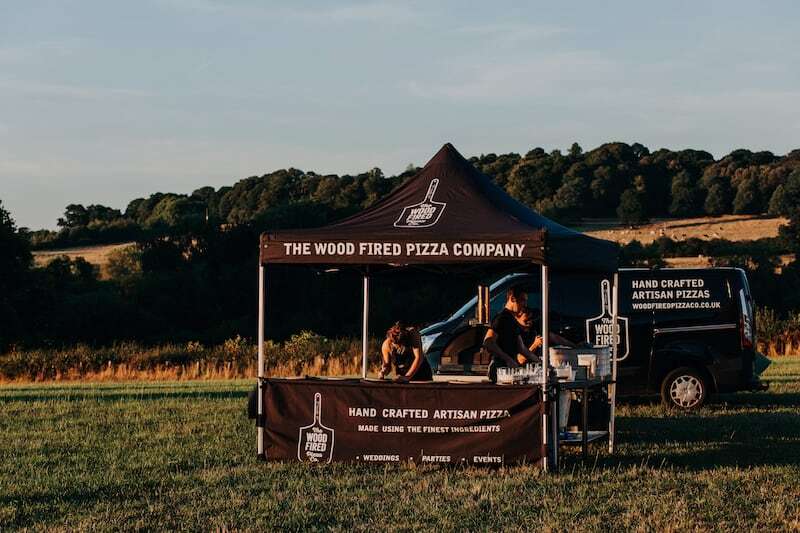 The Woodfired Pizza Company were great and there were so many toppings to choose from when creating our menu. There isn’t a thing we would change about our food choices and we would thoroughly recommend the companies we used. 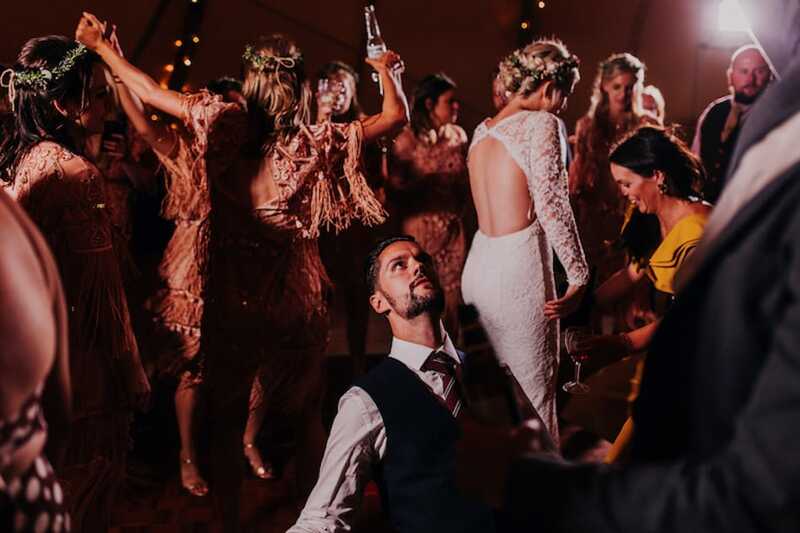 Overall, we really achieved the look and feel we were hoping for with our wedding. 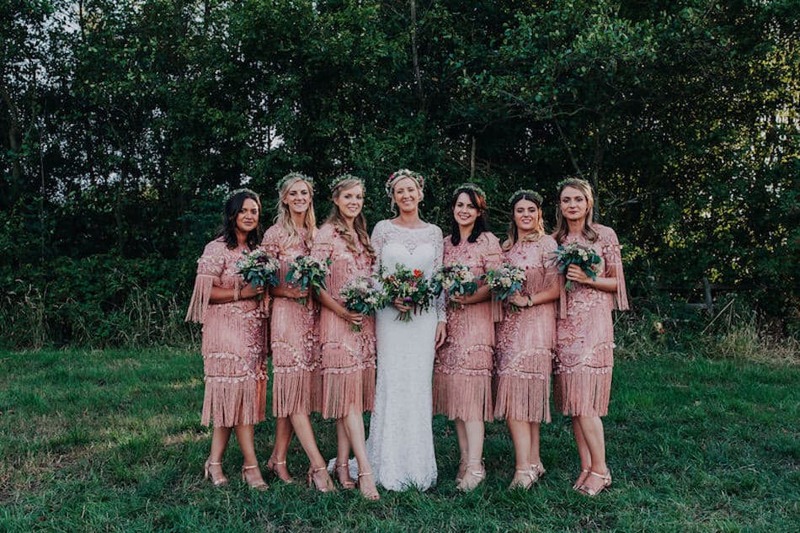 We would say it was woodland style with boho touches. It’s also important to mention that it had such a homely feel. The tipis allowed for that. We had made all of the decorations ourselves and wanted to feel proud of what we had achieved on the day. 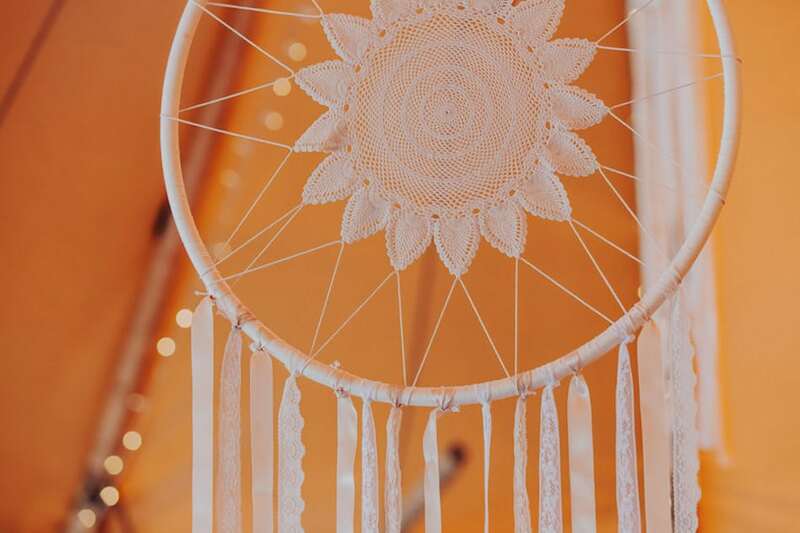 Seeing the decorations hang in the tipis on the day was the best! Tip One | OPEN DAYS, OPEN DAYS, OPEN DAYS!!! 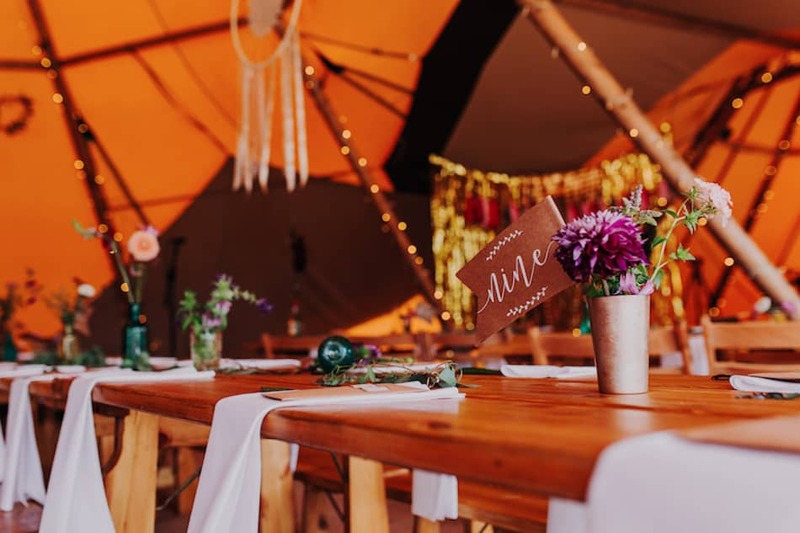 Visiting the tipis when they are all set up, looking glam is so incredibly helpful. 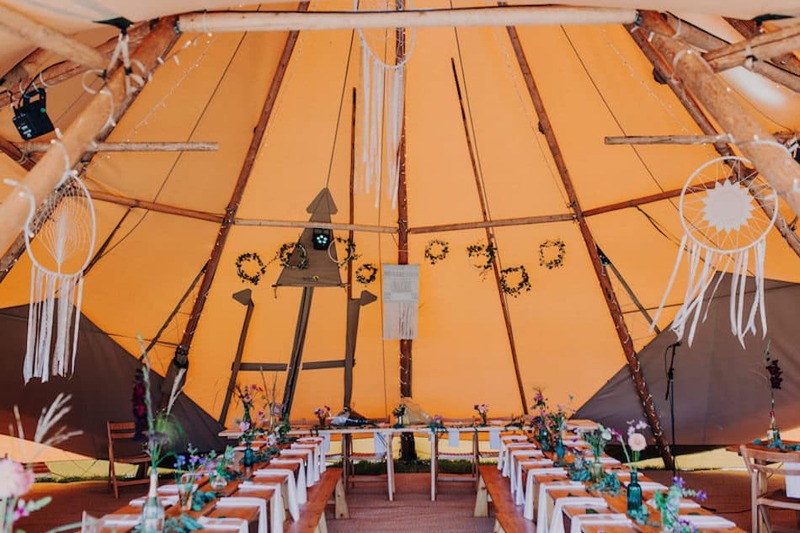 It helps you to visualise how you want your own tipis to look on the day and is so useful re decoration ideas. As well as this you get to meet so many people. 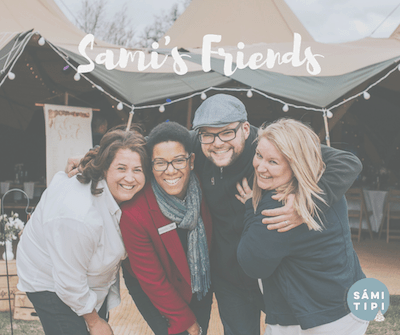 We met our florist (Maria at the Flower Patch – INCREDIBLE) at one of the Sami Tipi open day events and it was great because we saw what she has to offer and how it works in a Tipi setting. We also booked a magician that was performing there too! His name was Paul Grundle and he was such a crowd pleaser on the day! 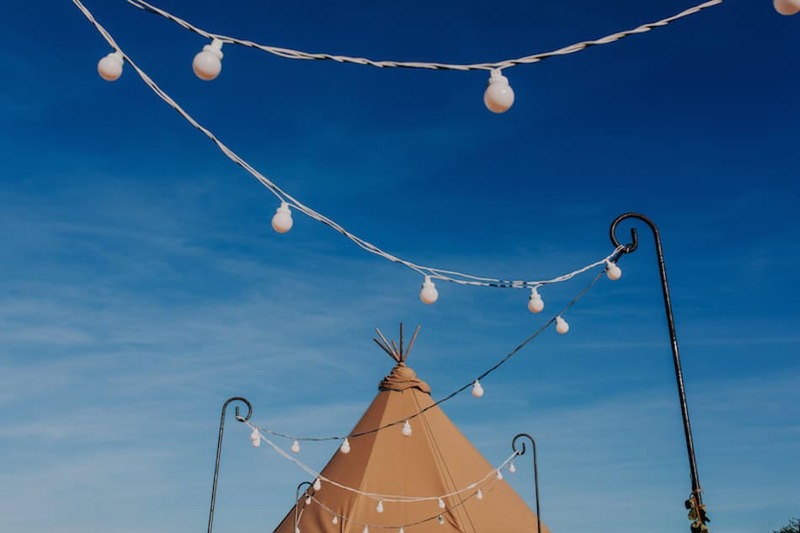 Because you can only visit the tipis so many times whether it be at open days or other events, you may be unsure on space, sizing, places to put things etc. 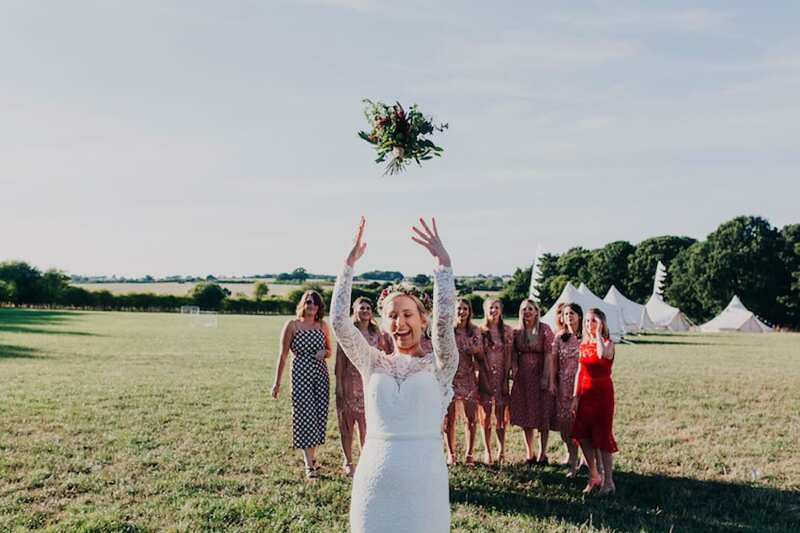 You will have your floor plan emailed over which is great, but we still emailed Jodie and the team with so many questions like ‘where do you think the cake table would work best?’ ‘What options do I have for hanging decorations in places that are out of reach?’ Ask as many questions as possible so you feel relaxed. 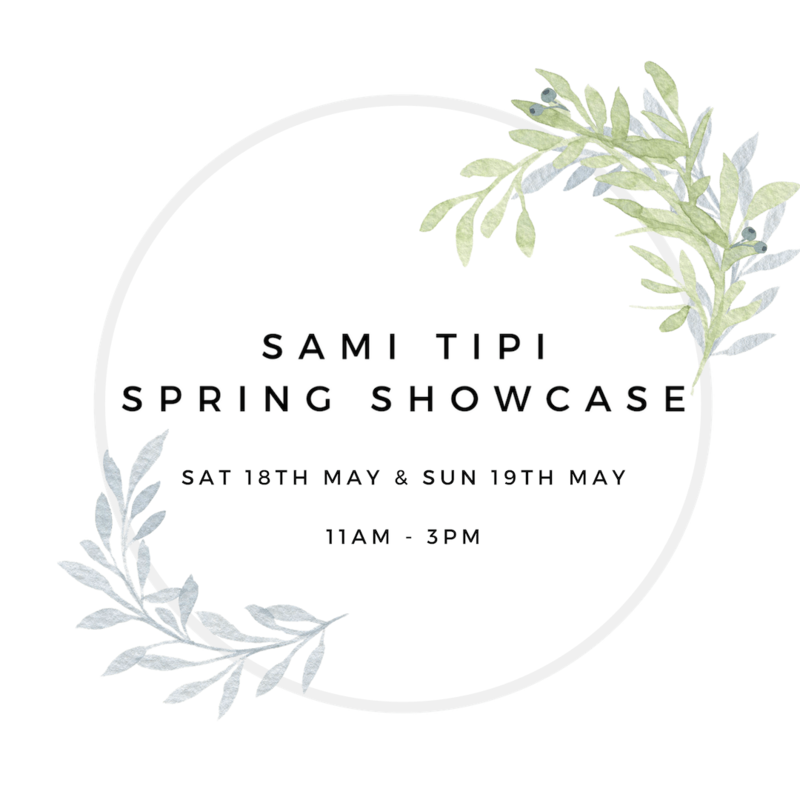 Nothing is too much trouble with Sami Tipi. This was such a biggy for us. 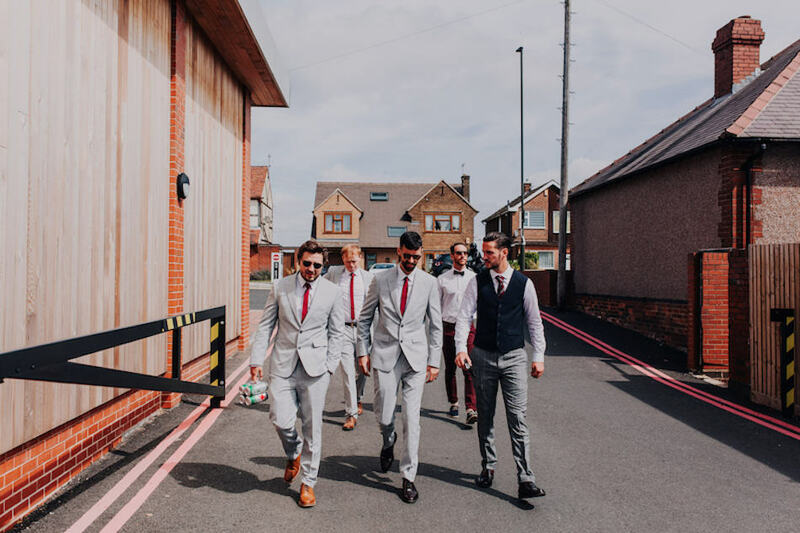 We panicked about rain or wind so much in the run up to the wedding when realistically we knew everything would be perfect either way, rain or shine. 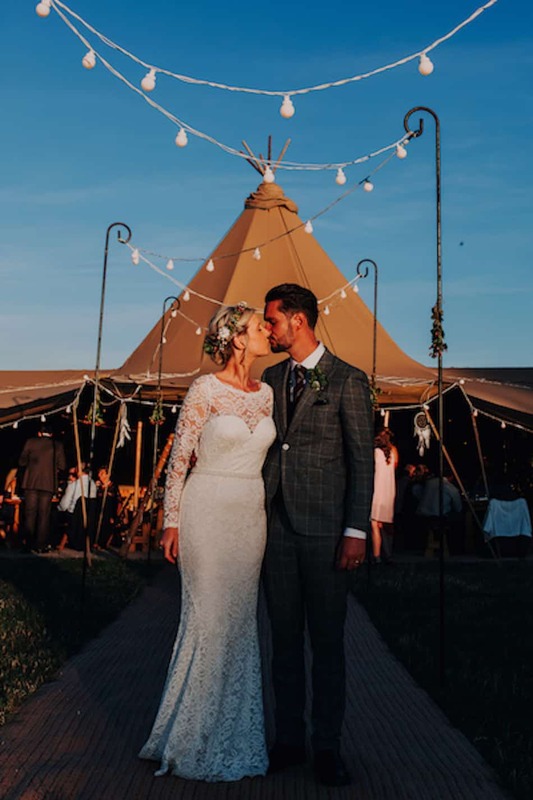 We were so lucky and had glorious sunshine for our whole wedding weekend but if we hadn’t been so lucky there is so much flexibility with the tipis. 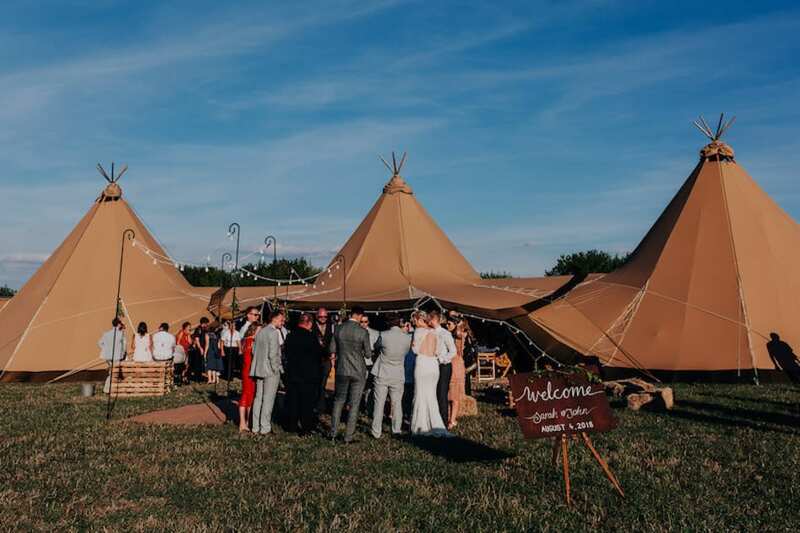 Tables can be moved to create extra space, sides can be opened or closed, not to mention your venue and Sami Tipi themselves will be monitoring the weather closely in the run up to your big day anyway. That way things can be adjusted if needed. 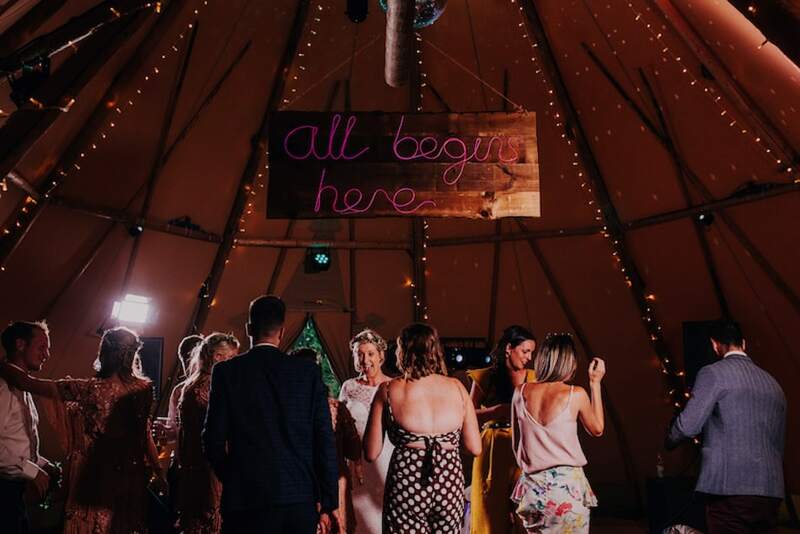 Having a tipi wedding isn’t the easiest option in the world. It is so incredibly worth it though. We cannot stress that enough. 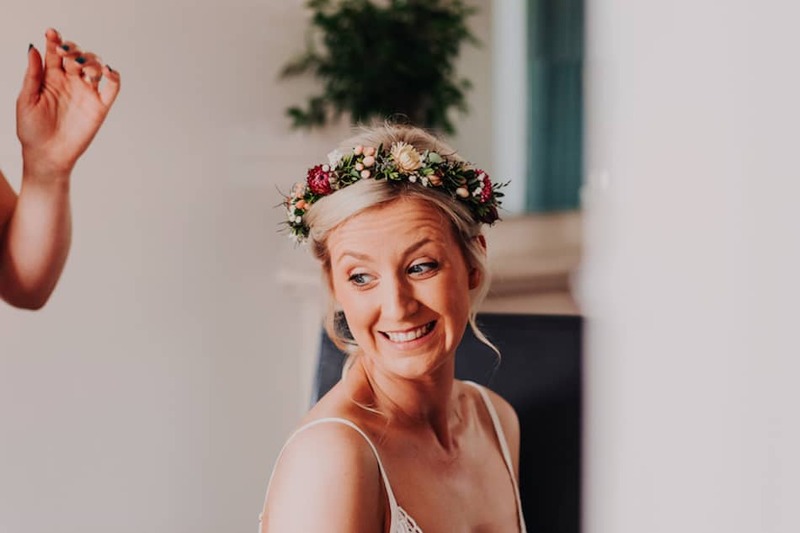 You stand in those giant hats on your special day and you just feel full of love. 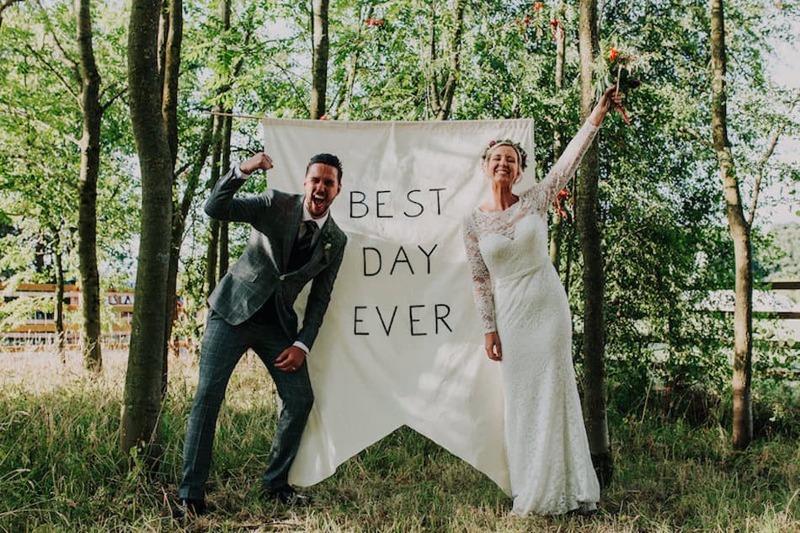 As we have sat here and typed all of this up we have completely relived our special day. 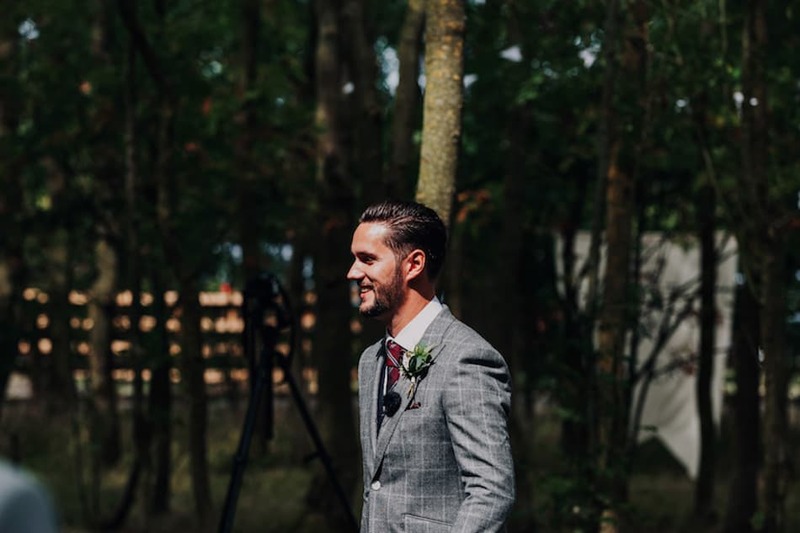 We still now, 3 months on, feel so incredibly lucky to have had such a perfect wedding weekend. 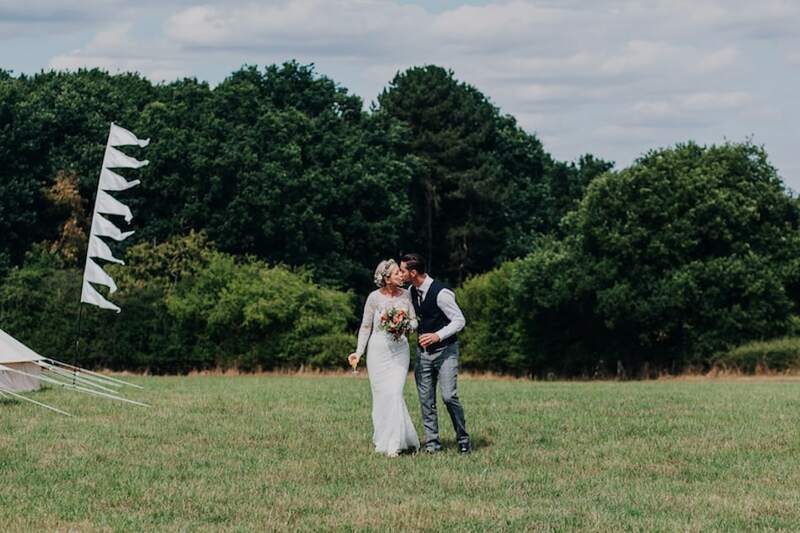 Our woodland tipi wedding was something we had dreamt of and spoken about for years. The fact it became a reality is just the best.